The SunRice ASX Listing video won bronze in the finance category. Anvil Media has won three awards at the 2018 GlobalTrend Video Awards, picking up bronze in the food and beverage, finance and training categories. The GlobalTrend Video Awards is an international competition that attracts outstanding digital and creative professionals, cinematographers, videographers and video production agencies from around the world. The 2018 competition results were announced on 31 August, 2018. 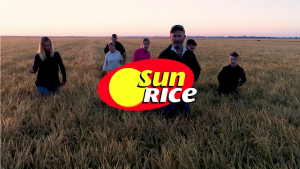 Two of Anvil Media’s winning entries showcased Australia’s vibrant rice growing industry, through recent projects that were completed with Sauce Communications for SunRice. The SunRice ASX Listing video picked up bronze in the finance category, for its role in conveying information to shareholders before the company’s transition to a publicly listed company. The Bringing Your Rice to Market video targeted export markets through highlighting Australia’s rice supply chain and quality. It received a bronze award in the food and beverage category. The third entry was the Meat Industry Essentials series developed for National Meat Industry Training Advisory Council Limited (MINTRAC). The 10-part series was awarded bronze in the training category. The series demonstrates correct safety and hygiene practices for the meat processing industry, and educates processing facility employees nationally. MINTRAC – Meat Industry Essentials.